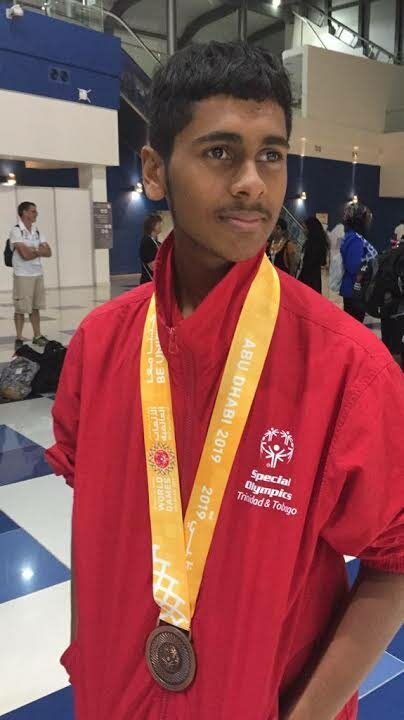 SPECIAL Olympics TT (SOTT) may just have to charter a flight home for the medals alone as they seized another two gold, five silver and seven bronze at the Special Olympics International 2019 World Games in Abu Dhabi, United Arab Emirates today. SOTT’s two latest gold medal wins came from Trent Bethel and Donovan Garib, who swam to victory in the 25m backstroke and the 100m freestyle, respectively, adding to SOTT’s incredible collection of medals. Janet Davis added considerably to the haul, taking four bronze medals in powerlifting. The count now stands at 35 medals: 12 gold, 13 silver and ten bronze. Bethel won his race in 16.42 seconds, the same race which featured his team-mate Nadira Mohan, who copped the bronze with a third place finish in 25.83 seconds. SOTT’s Melissa Nanan also challenged the race and placed sixth in 32.36 seconds. Meanwhile, Sapphire Jackson of Tobago, who won a gold medal on Monday, doubled up by claiming silver in the 100m walk event. She recorded a time of 19.27 seconds, trailing on Akuesson Bernisce of SO Benin, who clocked 17.88 seconds. Donald Doyle’s commitment and determination paid off when he won his first medal, bronze, in the long jump, recording a distance of 5.15m. Peter West Snider of SO Canada won with a 5.80m leap, followed by Chaiyaporn Pichaisong of SO Thailand (5.45m). SOTT sprinter Jonathan Walker won silver in the men’s 100m, blistering to the finish line in an outstanding time of 12.70 seconds, ahead of team-mate Justin Providence who did not disappoint with a fourth place finish with which he clocked 13.04 seconds. The athletics team will close today with the 4x100m relay. At the Hamdan Sports Complex, Nikoli Lalla placed seventh in the 100m freestyle race, which Garib won gold in, while Shania Surujbally’s fought her bout with illness, which prevented her from completing the open water swim on Monday, to claim a brilliant silver in the 800m freestyle. She clocked 18:19.30. There was yet another double silver medallist in Stefan Singh, who finished second in his 800m freestyle race, clocking 19:53.81. Competition in the pool will also close today and SOTT is expected to feature in the 4x50m freestyle and 4x50m medley relay. At the Abu Dhabi National Exhibition Centre, Alicia Khan and Michaellene Hosein represented SOTT in the unified bocce doubles and opened with victories against SO Thailand, 7:3, and SO Montenegro, 6:5. They were scheduled to play SO Panama and SO Chinese Taipei in their following two matches. The men’s team of Gary Boodoo and Kenrick Baksh, meanwhile, secured wins over SO Mauritius (12:1), SO Chinese Taipei (11:2) and SO Serbia (8:3), before facing SO Romania. In equestrian, at the Al Forsan International Sports Resort, the six SOTT equestrian athletes returned to action in dressage competition. Among the women, Aaliyah Harrigin won another silver with 190 points, Jamella Bart a bronze with 160 points and Kellie Simmons another fourth place finish, scoring 138 points. Reply to "No stopping SOTT: Raining gold in UAE"